WARNING: All occupants of the vehicle must wear their seat belts at all times. Seat belts and child restraints reduce the risk of serious or fatal injuries for all occupants in the event of a collision or sudden stop. Without a seat belt, occupants could be shifted too close to a deploying airbag, strike the interior structure or be thrown from the vehicle. Properly worn seat belts greatly reduce these hazards. Even with advanced airbags, unbelted occupants can be severely injured by a deploying airbag. Always follow the precautions about seat belts, airbags and occupant safety contained in this manual. WARNING: Every person in your vehicle needs to be properly restrained at all times, including infants and children. Never hold a child in your arms or lap when riding in a vehicle. The violent forces created during a crash will tear the child from your arms and throw the child against the interior. Always use a child restraint appropriate for your child's height and weight. NOTE: Small children are best protected from injury in an accident when properly restrained in the rear seat by a child restraint system that meets the requirements of the Federal Motor Vehicle Safety Standards. Before buying any child restraint system, make sure that it has a label certifying that it meets Federal Motor Vehicle Safety Standard 213. The restraint must be appropriate for your child's height and weight. Check the label on the child restraint for this information. Children who are too large for child restraint systems should always occupy the rear seat and use the available lap/shoulder belts. The lap portion should be fastened snug on the hips and as low as possible. Check belt fit periodically. A child's squirming could put the belt out of position. Children are afforded the most safety in the event of an accident when they are restrained by a proper restraint system in the rear seat. If a larger child (over age 13) must be seated in the front seat, the child should be securely restrained by the available lap/shoulder belt and the seat should be placed in the rearmost position. Children under the age of 13 should be restrained securely in the rear seat. NEVER place a child under the age of 13 in the front seat. NEVER place a rear facing child seat in the front seat of a vehicle. WARNING: Riding with a reclined seatback increases your chance of serious or fatal injuries in the event of a collision or sudden stop. The protection of your restraint system (seat belts and airbags) is greatly reduced by reclining your seat. Seat belts must be snug against your hips and chest to work properly. The more the seatback is reclined, the greater the chance that an occupant's hips will slide under the lap belt causing serious internal injuries or the occupant's neck could strike the shoulder belt. Drivers and passengers should always sit well back in their seats, properly belted, and with the seatbacks upright. WARNING: When you return the rear seatback to its upright position after the rear seatback was folded down, be careful not to damage the seat belt webbing or buckle. Be sure that the webbing or buckle does not get caught or pinched in the rear seat. A seat belt with damaged webbing or buckle will not be as strong and could possibly fail during a collision or sudden stop, resulting in serious injury. Entire in-use seat belt assembly or assemblies should be replaced if the vehicle has been involved in an accident. This should be done even if no damage is visible. Additional questions concerning seat belt operation should be directed to your Hyundai Dealer. You can adjust the height of the shoulder belt anchor to one of the 4 positions for maximum comfort and safety. If the height of the adjusting seat belt is too near your neck, you will not be getting the most effective protection. The shoulder portion should be adjusted so that it lies across your chest and midway over your shoulder nearest the door and not your neck. To adjust the height of the seat belt anchor, lower or raise the height adjuster into an appropriate position. To raise the height adjuster, pull it up. To lower it, push it down while pressing the height adjuster button. Release the button to lock the anchor into position. Try sliding the height adjuster to make sure that it has locked into the position. WARNING: o Verify the shoulder belt anchor is locked into position at the appropriate height. Never position the shoulder belt across your neck or face. Improperly positioned seat belts can cause serious injuries in an accident. o Failure to replace seat belts after an accident could leave you with damaged seat belts that will not provide protection in the event of another collision leading to personal injury or death. Replace your seat belts after being in an accident as soon as possible. To fasten your seat belt, pull it out of the retractor and insert the metal tab into the buckle. There will be an audible "click" when the tab locks into the buckle. The seat belt automatically adjusts to the proper length only after the lap belt portion is adjusted manually so that it fits snugly around your hips. If you lean forward in a slow, easy motion, the belt will extend and let you move around. If there is a sudden stop or impact, however, the belt will lock into position. It will also lock if you try to lean forward too quickly. NOTE: o If you are not able to pull out the safety belt from the retractor, firmly pull the belt out and release it. Then you will be able to pull the belt out smoothly. o If the driver's seat belt is not fastened when the ignition key is in the "ON" position, the seat belt warning light will flash and the warning chime will sound for approximately six seconds. Combination retractor type seat belts are installed in the rear seat positions to help accommodate the installation of child restraint systems. Although a combination retractor is also installed in the front passenger seat position, Hyundai strongly recommends that children always be seated in the rear seat. NEVER place any infant restraint system in the front seat of the vehicle. This type of seat belt combines the features of both an emergency locking retractor seat belt and an automatic locking retractor seat belt. To fasten your seat belt, pull it out of the retractor and insert the metal tab into the buckle. There will be an audible "click" when the tab locks into the buckle. When not securing a child restraint, the seat belt operates in the same way as the driver's seat belt (Emergency Locking Retractor Type). It automatically adjusts to the proper length only after the lap belt portion of the seat belt is adjusted manually so that it fits snugly around your hips. When the seat belt is fully extended from the retractor to allow the installation of a child restraint system, the seat belt operation changes to allow the belt to retract, but not to extend (Automatic Locking Retractor Type). NOTE: Although the combination retractor provides the same level of protection for seated passengers in either emergency or automatic locking modes, it is recommended that seated passengers use the emergency locking feature for improved convenience. The automatic locking function is intended to facilitate child restraint installation. To convert from the automatic locking feature to the emergency locking operation mode, allow the unbuckled seat belt to fully retract. WARNING: o For maximum restraint system protection, the seat belts must always be used whenever the car is moving. o Seat belts are most effective when seatbacks are in the upright position. o Children age 12 and younger must always be properly restrained in the rear seat. Never allow children to ride in the front passenger seat. If a child over 13 must be seated in the front seat, he/she must be properly belted and the seat should be moved as far back as possible. o Never wear the shoulder belt under your arm or behind your back. An improperly positioned shoulder belt can cause serious injuries in a crash. The shoulder belt should be positioned midway over your shoulder across your collarbone. o Avoid wearing twisted seat belts. A twisted belt can't do its job as well. In a collision, it could even cut into you. Be sure the belt webbing is straight and not twisted. o Be careful not to damage the belt webbing or hardware. If the belt webbing or hardware is damaged, replace it. 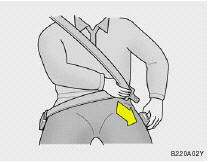 WARNING: You should place the lap belt portion as low as possible and snugly across your hips, not on your waist. If the lap belt is located too high on your waist, it may increase the chance of injury in the event of a collision. Both arms should not be under or over the belt. Rather, one should be over and the other under, as shown in the illustration. Never wear the seat belt under the arm nearest the door. 1. 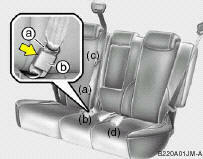 Before fastening the rear seat center belt, confirm the metal tab (a) and buckle (b) are latched together. 2. After confirming that (a) and (b) are latched, pull the seat belt out of the retractor and insert the metal tab (c) into the buckle (d). WARNING: o Never let anyone ride in the rear center seat without fastening all metal tabs and buckles as described in this section. This seat belt is designed to function as a typical 3-point restraint (lap/shoulder belt). Using only the shoulder portion or lap portion of the belt can result in serious or fatal injuries in the event of a collision or sudden stop. WARNING: o Never unlock the metal tab (a) and the buckle (b) with the following exceptions. (1)In case of folding rear seatbacks down. (2) If transporting an object on the rear seat may cause damage to the rear seat center belt. o Always lock metal tab (a) into buckle (b) immediately after returning the rear seatbacks to an upright position. This portion of the rear center seat belt should only be unbuckled when the rear seatback is folded down. o In case of unlocking metal tab (a) and the buckle (b), place metal (a) in the seat belt clip not to make noise while driving. To disconnect the metal tab (a) from the buckle (b) , insert a narrow-ended tool into the groove located on the buckle (b). 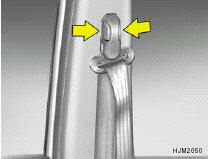 WARNING: The rear seat center belt latching mechanism is different from those for the outboard rear seat shoulder belts. When fastening the outboard rear seat shoulder belts or the rear seat center belt, make sure they are inserted into the correct buckles to obtain maximum protection from the seat belt system and assure proper operation.